Inmarsat 5-F3 is a commercial communications satellite built by Boeing Satellite Systems for operation by the British satellite telecommunications company Inmarsat. 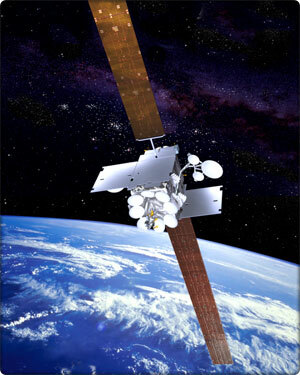 Three identical satellites were ordered from Boeing in August 2010 with a fourth ordered as a spare in 2013 – all flying under the Inmarsat-5 designation. The Inmarsat-5 satellites are based on Boeing’s 702HP High-Power Satellite Platform that is capable of hosting powerful communications payloads with payload power of up to 18kW with state of the art onboard systems including precise pointing capability and the use of flight-proven components and built-in redundancy to ensure the satellite meets its in-orbit lifetime of 15 years. In the stowed launch configuration with the antennas and solar arrays stowed against the satellite body, the spacecraft measures 6.98 meters (height) by 3.59m (width) by 3.27m (length). 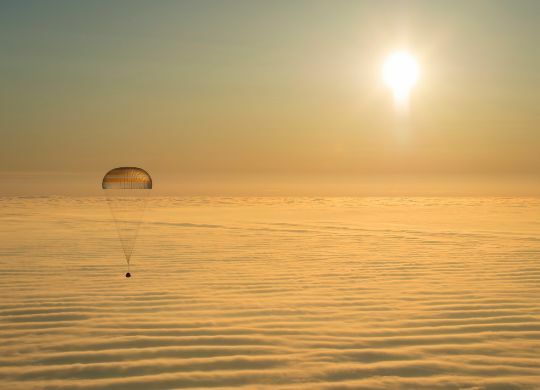 Once in orbit, the two solar arrays are deployed creating a span of 33.80 meters. With the communication antennas and two external radiators deployed, the satellite measures 8.08 meters from side to side. The spacecraft has a launch mass of 6,100 Kilograms and weighs 3,750kg when beginning its life in Geostationary Orbit. The two deployable solar arrays each have five wings that are covered with ultra triple-junction gallium-arsenide solar cells that deliver a beginning of life power of 15 Kilowatts decreasing to 13.8kW at the end of the satellite’s service life. Power is stored in dual Lithium-Ion batteries and dedicated avionics regulate the main power bus of the spacecraft to provide power to all subsystems of the satellite bus and the communications payload. Inmarsat-5 F3 is equipped with a 445-Newton bipropellant Liquid Apogee Engine that is used for the initial climb to Geostationary Orbit. In addition, the satellite uses four axial 22-Newton Thrusters and four radial 10-Newton thrusters for smaller orbit adjustments, drifting in Geostationary Orbit and attitude maneuvers. Inmarsat-5 F3 also uses an xenon ion propulsion system (XIPS). XIPS-25 provides a thrust of 165 Millinewtons. This system can be used for Stationkeeping or drifting in Geostationary Orbit and for satellite momentum control. Using ion thrusters is more efficient in terms of fuel consumption and can extend a satellite’s lifetime beyond its limited storable fuel supply. The spacecraft facilitates a total of 89 Ka-Band transponders that create 89 user beams that are generated by 2 transmit and 2 receive apertures. Six steerable spot beams are used to provide flexible communication services. The high-capacity spot beams are fed by twelve 130-Watt traveling-wave tube amplifiers while the regular communication beams use bent-pipe repeaters and 60:48 TWTAs. 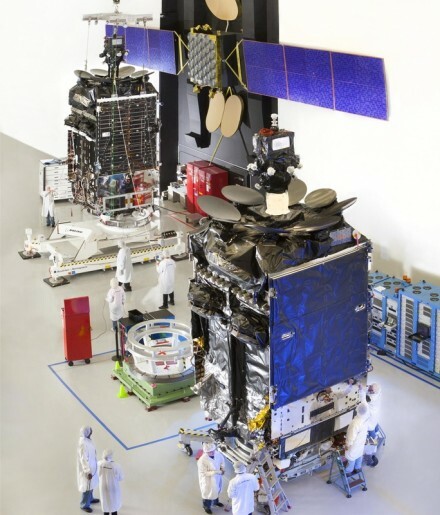 The communications payload provides flexible global coverage and also includes a hosted Ka- and L-Band payload for use by the US Government. The Inmarsat-5 satellites will provide global mobile satellite services, including mobile broadband communications for deep-sea vessels, in-flight connectivity for airline passengers and streaming high-resolution video, voice and data. Secure communications can also be provided for government or commercial users. Inmarsat 5-F3 is planned to operate from a position of 180 degrees west in Geostationary Orbit, joining the F1 satellite that is located at 63 degrees east and F2 at 55 degrees west. The satellite will deliver a data throughput up to 50Mbps to the Pacific Ocean region over a planned service life of 15 years.